Leonard Joel "Lenny" Baker (January 17, 1945 - April 12, 1982) was an American actor of stage, film, and screen, best known for his Tony Award-winning performance in I Love My Wife in 1977. Baker was born in Boston, Massachusetts, the son of Bertha and William Baker. A 1962 graduate of Brookline High School, he received his college degree from Boston University, and performed in regional theater. He spent several summers at the O'Neill Center's National Playwrights Conference in Waterford, Connecticut. Baker appeared Off Broadway in plays such as Conerico Was Here to Stay, Paradise Gardens East, The Year Boston Won the Pennant, and Summertree, debuting on Broadway in 1974 in The Freedom of the City, performing in repertory in Secret Service and Boy Meets Girl, and in Pericles, Prince of Tyre, The Merry Wives of Windsor, Henry V, and Measure for Measure with the Joseph Papp New York Shakespeare Festival. He devoted himself to the production of new plays at The O'Neill Center's National Playwrights Conference where he worked with Werner Liepolt and many other young playwrights. He was highly praised by critics Clive Barnes and Walter Kerr and won the Tony Award for his performance in I Love My Wife. In the course of his career, Baker appeared in a number of television shows, such as Kojak, Starsky and Hutch, The Rockford Files, and Taxi. Far and away most prominent amongst his film roles, which included The Hospital and The Paper Chase, was Next Stop, Greenwich Village, for which he was widely praised by critics, and for which he was nominated for a Golden Globe Award. Baker's career was cut short by illness. Throat problems led to him leaving the cast of the pre-Broadway show Broadway, Broadway in 1978, and his final television performances were in 1979. He died on April 12, 1982 of medullary thyroid cancer. He had two brothers, Alan and Malcolm. ^ "Tony Legacy Search Results: I Love My Wife". The American Theatre Wing's Tony Awards. Retrieved 2008-07-06. ^ "Seems Four Ladies Hoping to be Mrs. William Paley". Lakeland Ledger. 30 August 1978. Retrieved 17 May 2016. Joseph Papp was an American theatrical producer and director. He established The Public Theater in what had been the Astor Library Building in lower Manhattan. There, Papp created a year-round producing home to focus on new plays and musicals. Among numerous examples of these were the works of David Rabe, Ntozake Shange's For Colored Girls Who Have Considered Suicide When the Rainbow Is Enuf, Charles Gordone's No Place to Be Somebody, and Papp's production of Michael Bennett's Pulitzer Prize–winning musical, A Chorus Line. Papp also founded Shakespeare in the Park, helped to develop other off-Broadway theatres and worked to preserve the historic Broadway Theatre District. 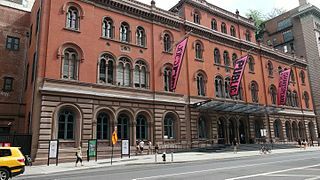 The Public Theater is a New York City arts organization founded as the Shakespeare Workshop in 1954 by Joseph Papp, with the intention of showcasing the works of up-and-coming playwrights and performers. It is led by Artistic Director Oskar Eustis and Executive Director Patrick Willingham. The venue opened in 1967, mounting the world-premiere production of the musical Hair as its first show. David Edwin Birney is an American actor/director whose career has performances in both contemporary and classical roles in theatre, film and television. Edward Cornell was an early associate of Joseph Papp at the New York Shakespeare Festival. He was the first managing director of the Festival's experimental wing, The Other Stage, where he directed No Place to Be Somebody, the Festival's first Pulitzer Prize winner.